We’ve accomplished something scores of archeologists, with a lifetime of study, have failed to do. With a single visit to a single Mayan site, we’ve solved the enduring mystery of what caused the collapse of a once great civilization. Over some 3,000 years of development, the Mayan people progressed into a populous and intellectually advanced society. At their peak, around 800 A.D., they had acquired an advanced understanding of mathematics, astronomy, agriculture and architecture. They built elaborate city states with magnificent palaces and soaring temples that supported a population of millions. And then, sometime around the 8th century, this great society went into decline. Its city states were eventually abandoned; its population dispersed. The reasons for the collapse are still unexplained. That is until know. A chemical reaction between water, algae, and limestone creates a soapy like material. We found it covering most surfaces on the day of our visit, making everything as slick as ice. 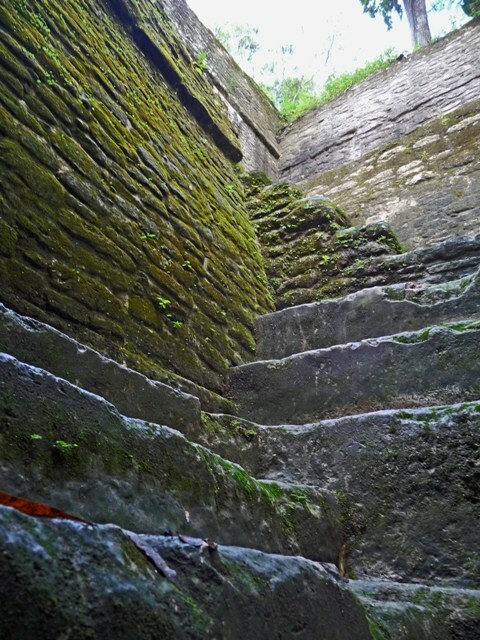 Nobody knows why the elite Mayan family left Cahal Pech, or why the Mayan abandoned their magnificent cities, but it is likely they mostly met their demise on one of the many impossibly steep and slippery stair cases – just as we almost did. I know this first hand…ended up in hosptial in Guatemala thanks to very similar steps in Tikal and their ample slipperyness! Sounds very reasonable to me, sllppery slopes will do us all in, if not careful. Even in Pembrokeshire … in my back garden, slippery steps … my son Luke can tell you all about his demise! Perhaps the Mayans should have shared their experiences with the Incans. 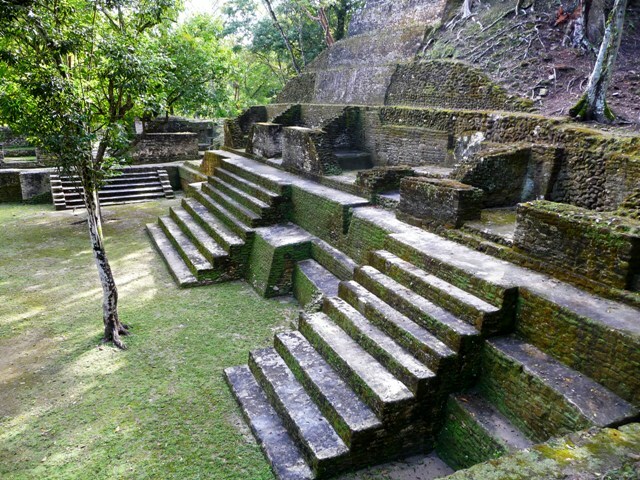 I’ve never been to Cahal Pech, but I’ve been to Machu Picchu and there are a lot of steep stairs there where I’ve lost my footing a few times. Oh, I saw miss all those Mayan archeological sites! How many of them did you visit in Belize? It is on my bucket list! I think we’ve hit five different sites. All very different and interesting.